The Veronica presents an easy to grow plant that butterflies love. Butterflies will visit them frequently from spring until the fall. They have a slight fragrance that many gardeners find pleasing. At least one of the available species is considered to be edible. It has a taste that has been compared to that of the watercress. Care should be taken when searching for wild species to consume. V. americana is an edible species that many enjoy as a salad green. It has been used in folklore medicine as well as homeopathic remedies. It is similar in appearance to skullcap, which can be dangerous. If harvesting from the wild, proper identification is essential. The stems from this species are rounded, instead of square sided. The blooms are often a delicate blue and have large petal faces. Several of the species are considered to be weeds in most regions. They grow quickly and will spread along many areas if undisturbed. Some may use herbicides on the species to slow or stop its growth. 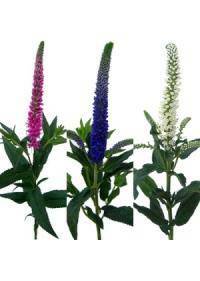 The Veronica plant is one of the easiest to care for garden flowers. It requires little maintenance and will flourish wildly in most soils. This makes it a very popular flower for many gardens and lawns. These sun loving blooms prefer a full day of sun in a garden setting. In very hot and sunny climates, partial sun may become necessary. Container gardens should be placed where the sun will be abundant. The soil should always be kept moist and not allowed to dry out. Compost should be added around the base of plants to add moisture. Proper drainage should be ensured to prevent the roots from rotting. Every spring, new compost should be added around each of the plants. This will also help to control the humidity that the plants need. Compost will also help to slow the growth of weeds in a garden. Every few years, the plants may need to be divided to control spread. The ones that are thinned out may be planted elsewhere if desired. This will help prevent overcrowding and encourage better blooms. The most commonly attributed meaning for blooms is that of fidelity. There are many ways that this fidelity meaning can be interpreted. The inclusion of other flowers can also have impact on its meaning. Used on its own, it can represent fidelity of the heart in marriage. A bouquet may be used to demonstrate that the marriage is pure. It may also be used to show that there has been no breach of fidelity. The easy care that it needs can be used to show carefree feelings. It can be a sign that all is well and that there should be no stress. This can be a good choice when creating a get well basket or bouquet. They can also be used to show loyalty when given as a live gift. The often rich blue color can demonstrate faithfulness in feelings. This can apply to many events or occasions when arrangements are used. These are often used in a home grown bouquet, cut from a garden. Many may prefer to simply give them as a potted plant in a basket. Veronica plants may also be used as a decoration for centerpieces. They can be ordered in either plant or cut form in areas such as Ann Arbor, MI, Elk Grove, CA, Sacramento, CA, Mobile, AL, and Brownsville, TX.